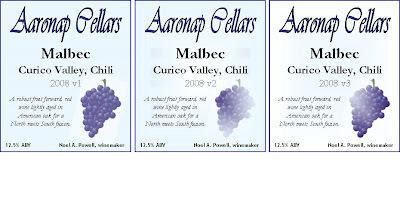 Aaronap Cellars Winemaker's Journal: One malbec, two malbecs, three malbecs--Ah, ah, ah! One malbec, two malbecs, three malbecs--Ah, ah, ah! If you're like me, you're probably scratching your head wondering where the summer has gone this year. Seems like it was just a few weeks ago that the daffodils were poking their blooms up and now it's after Labor Day. Although my absence on the web has gone on for longer than I wanted, my winemaking efforts have not stopped. So I'll try to recoup the summer and catch everyone up to speed. One of my biggest achievements was getting the 19 gallons of 2008 Chilean Malbec out of the barrel and bottled. When last I posted on the Malbec in April, I was facing a rather bitter taste that seemed to be fading with barrel age. At the time, I had 10 gallons that have been in a new American oak barrel for about 6 months and 9 gallons that had been in the same barrel for 1 month as it was breaking in. The later batch was split between a 6 gal and 3 gal carboy and I had treated the 3 gal carboy with 0.08 oz/gal of Biolees for 4 months to see if that would soften the bitter taste. In July, I was finally happy with the taste. All of the carboys had a much smoother taste so I decided to bottle in 3 separate versions. I'm going to do some tasting samples this week and edit the post with my notes and pictures, so stay tuned.